A given atom will absorb and emit the SAME frequencies of electromagnetic (E-M) radiation. A gas of hydrogen atoms will produce an absorption line spectrum if it is between you (your telescope+spectrograph) and a continuum light source, and an emission line spectrum if viewed from a different angle. If you were to observe the star (a source of white light) directly, you would see a continuous spectrum, with no breaks. 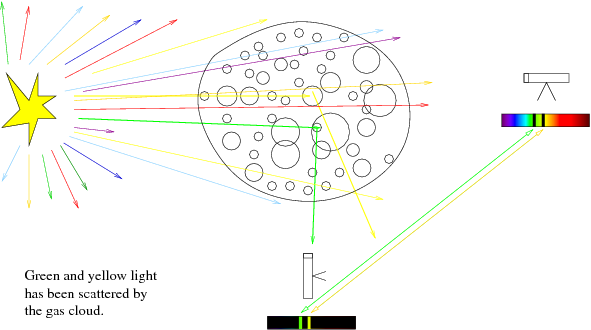 If you observe the star through the gas (telescope to right of gas cloud, points towards star through cloud), you will see a continuous spectrum with breaks where specific wavelengths of energy have been absorbed by the gas cloud atoms and then re-emitted in a random direction, scattering them out of our telescope beam. We call this an absorption spectrum (continuous + dips). If you observe the gas but not the star (telescope below gas cloud, points through gas but away from star), you will only see a portion of the scattered light being re-emitted by the gas. The continuum radiation from the star will not fall into our telescope beam, because we are pointed away from the star. This is called an emission spectrum (just peaks, not continuous). The E-M radiation frequencies absorbed and emitted match the allowed energy levels in the atom. 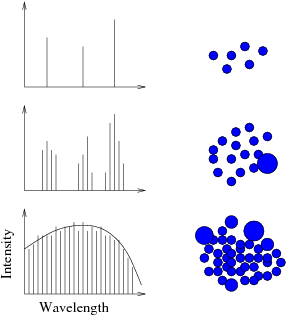 The allowed energy levels in an atom depend mostly on the electric field configuration. Hydrogen, with one proton in the nucleus, has a different field configuration than does Helium with two protons – this is why the two atoms have a different energy levels and different characteristic absorption and emission lines. Continuum spectrum: A gas can be collisionally excited. Imagine a hot gas. The atoms are flying around, bumping into one another and sometimes the energy of motion during the collision will bump an electron into a higher energy level (or completely ionize the atom, freeing the electron completely). When this electron drops back down to lower energy, a photon is emitted. This conversion of kinetic energy into radiant energy cools the gas. There is a connection between emission lines from a gas and the continuous spectrum from a solid. As you crowd atoms together (as in a solid), the allowed energy levels in one atom start to become distorted due to the influence of the electric field of neighboring atoms. Distort an energy level difference a little bit and you get a slightly different frequency emission/absorption line. A distribution of distortions leads to a distribution of lines than eventually blend into a continuum. Here we see the way that a spectrum fills in as the density of our medium increases (from gas to solid) by clumping particles together. 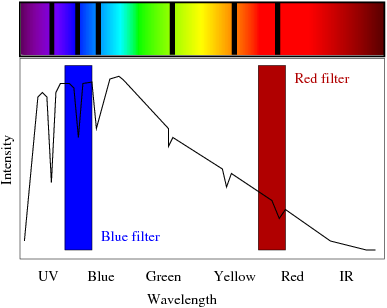 Absorption spectrum: What do stellar spectra look like (the light observed from stars)? Stars have absorption line spectra. We can think of stars as a hot continuum source with a "cool" atmosphere of absorbing gas. The wavelengths that get absorbed depend on the chemical make up of the gas in the stellar atmosphere. In the 1800's the light from the Sun was dispersed and it looked more-or-less like a Planck spectrum (a blackbody curve) with some missing light, or absorption lines at certain wavelengths. Stellar blackbody spectra have a characteristic shape, with a steep rise, a peak in or near to the visual passband, and a slow decrease in the infrared. Hotter stars have higher peak amplitudes, and peak at shorter wavelengths. Blackbody curves are shown for three stars in the figure below, with temperatures ranging from 4,000 K (a cool, red star) to 7,500 K (a hot, violet-blue star). Small arrows mark the peak wavelength for each star. 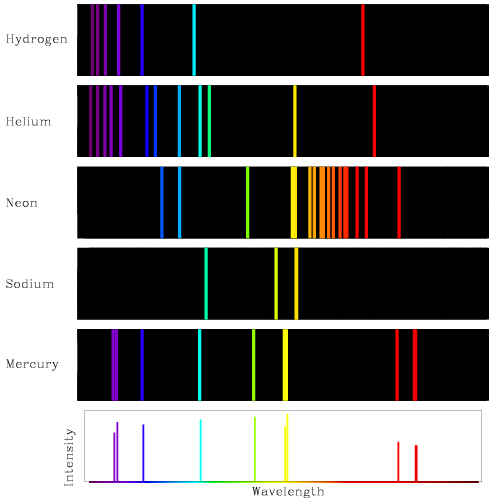 Emission spectrum: The wavelengths with missing light in a stellar spectrum turned out to be very interesting and important. Their importance was realized after emission line spectra were discovered and investigated by chemists. 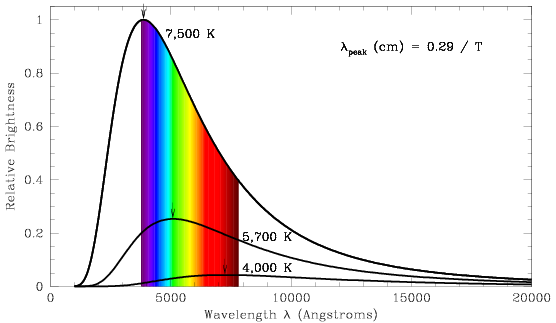 If a gas is heated to the point where it glows, the resulting spectrum has light at discrete wavelengths that turn out to match the wavelengths of missing light in stellar spectra. So by studying the spectra of various elements in a laboratory here on Earth, we can determine the composition of the distant stars! Thanks to Mike Bolte (UC Santa Cruz) for the base contents of this slide.